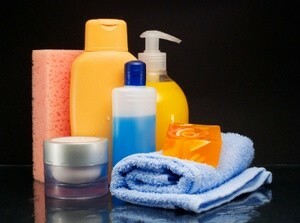 One regular expense that most of us have is toiletries. Unfortunately, we can’t cut back too drastically on such items because most of us prefer to be clean, fresh and nice-smelling. So while you probably don’t want to cut out these items, there are ways to save a few pennies and stretch your dollars while staying clean, fresh and pretty. Sure, you can buy spray bottles of detangling spray for your hair or your kids’ hair, but I save money by making my own. It’s quite easy, works great and saves some money. If you have an empty spray bottle that used to hold store-bought detangler, use it or purchase a spray bottle at your local Wal-Mart. A bottle of cheap conditioner is just the ticket for this detangler. I use Suave brand because it is inexpensive and comes in a variety of scents that I really like. Currently I am using coconut-scented conditioner and I love the smell. Mix the conditioner with water in the spray bottle at a ratio of one part conditioner to 10 parts water. Shake to mix thoroughly then spray small amounts on your hair before combing out the tangles. It works great and one bottle of conditioner will last a long time. That bottle of coconut-scented conditioner I use to make detangler gets even more use around my house–as shaving gel. Cheap conditioner works great as a shaving gel for shaving my legs and underarms–it is cheap, cheap, cheap and it really does work. I can’t guarantee how it works for a man to shave his face because I am not a man and I do not shave my face, but I would venture a guess to say it works just as well as it does when I mow the hair off of my legs. Transfer your body wash, shampoos and conditioners into pump bottle dispensers to cut down on waste. The pump will help you use only the necessary amount of product. You can purchase pump bottles at many retail stores or you can save the disposable pump dispensers from hand soap. My local Sam’s Club also sells body wash in bulk already in a large pump dispenser that can, of course, be reused. Make a visit to your local thrift stores and you might find pump bottles at rock bottom prices. These are just a few simple ways to cut down on the cost of toiletries. Take a look around your bathroom and at your own toiletries to see what you can do to stretch your budget and save a few pennies. I agree with the pump bottles for shampoo especially. We have six kids and go through so much less shampoo with the pump bottle. Good tip.